Catherine Jagiellon (Polish: Katarzyna Jagiellonka; Swedish: Katarina Jagellonica, Lithuanian: Kotryna Jogailatė; 1 November 1526 – 16 September 1583) was a Polish princess and the wife of John III of Sweden. As such, she was Duchess of Finland (1562–83), Queen of Sweden (1569–83) and Grand Princess of Finland (1581–83). Catherine had significant influence over state affairs during the reign of her spouse, and negotiated with the pope to introduce a counter reformation in Sweden. Catherine Jagiellon was born in Kraków as the youngest daughter of King Sigismund I the Old of the Polish-Lithuanian Commonwealth and his wife Bona Sforza of Milan. Catherine became the spouse of King John III of Sweden and mother of the future Sigismund III Vasa, King of Poland. After the death of her father in 1548, she and her sisters Anna and Sophia moved to Masovia with their mother. After their mother's departure to Italy in 1558, they lived there alone. The sisters were not close to their brother Sigismund II Augustus of Poland. Catherine could reportedly speak Italian and Latin, and was described as more attractive than Anna, and most marriage suggestions were directed toward her. Duke Albert of Prussia, Archduke Ferdinand II of Austria and Tsar Ivan IV of Russia were among her suitors. A Swedish-Polish dynastic marriage alliance had been suggested already in 1526, that time between her half-sister Hedwig and King Gustav I of Sweden, and in 1555, a marriage was suggested between her and Crown Prince Eric or his brother John. In 1560, John resumed the negotiations on his own initiative and without the consent of Eric XIV. On 4 October 1562, Catherine was married in the Lower Castle of Vilnius, Lithuania, to Duke John of Finland, the second son of Gustav I and half-brother of the then-reigning King Eric XIV. John had not received his brother's permission for the marriage and there were already tensions between them, since John pursued an independent foreign policy. The marriage was conducted in a Catholic ceremony. Catherine brought a large entourage and luxurious possessions, but actually her dowry and inheritance after her mother was never given. The couple set up house in Turku Castle in Turku, Finland. Duke John's dealings in Livonia caused King Eric XIV to declare war on his brother. Eric sent 10,000 men to besiege the castle. On 12 August 1563 the castle capitulated; Catherine and John were taken to Sweden and imprisoned in Gripsholm Castle. Eric offered to allow Catherine to return to Poland, but she chose to accompany John in prison. She asked for the larger part of her entourage to be sent home, only keeping some Polish ladies-in-waiting and her Court dwarf Dorothea Ostrelska, who is often mentioned in connection to her. During her incarceration, Catherine gave birth first to her eldest daughter Isabella of Finland in 1564 (died 1566), then to her son Sigismund in 1566. Catherine was used as a valuable hostage by Eric, but because of her, the imprisonment was lenient. In October 1567, John reconciled with Eric, and the couple was released. Catherine and John apparently developed a close relationship during the years of imprisonment. Catherine's unsuccessful suitor Tsar Ivan was in negotiations with Eric in hopes of separating her from John and sending her to marry him in Russia. This caused alarm with Catherine and her relations. In popular opinion, this discussion was one of the reasons for the Swedish people's growing dissatisfaction with the increasingly insane Eric. King Eric agreed to hand over Catherine to Ivan, but the Swedish king was deposed before Catherine could be sent away. As his brother John succeeded him, the problem disappeared. Catherine was at Vadstena during the rebellion. Another reason which agitated the nobility against Erik XIV and made them encourage the rebellion of Duke John and his brothers Duke Charles, was the marriage of Erik to the commoner Karin Månsdotter, which the nobility regarded as an insult. Catherine played some part in the rebellion: she was a friend of one of Erik's enemies, Ebba Månsdotter (Lilliehöök), who had an influential position within the nobility, and she was also directly approached by Pontus De la Gardie, who appealed to her to persuade the indecisive John to join the rebellion against the King in protest of his scandalous marriage. According to a witness, she answered: "Pontus! I have heard your advise and the reasons you present well and good, and they are all very correct and just, but hard to realise. My dear friend, show me the curtsy to allow this to remain between us, and I will speak to my lord and husband." After the fall of Stockholm, she made her entrance to the city in a grand procession at 7 November 1568. Catherine was crowned queen of Sweden in the spring of 1569. Her relationship with John III continued to be very good during her lifetime, and there are no extramarital partners known on either side. She had her own Catholic chapel and her own Catholic staff, among them several Catholic monks and priests, which shocked the Protestants. Her court was headed by Karin Gyllenstierna. As a person, it does not seem to be much slander about her. Her fervent Protestant brother-in-law, the future Charles IX mentioned her in his chronicle when he described King John: "His Princess was full of virtue and piety, still her faith did come from Rome". Queen Catherine had political influence, and influenced the monarch within many areas, such as his foreign policy and his interest in renaissance art. It is a revealing fact, that the king's diplomatic contacts with the Catholic powers quickly diminished after her death. Foremost, however, she is known to have influenced John III in his religious policy in favour of Catholicism and the Counter-Reformation, just as the next queen and spouse of John III, Gunilla Bielke, would influence his religious policy in favor of Protestantism. After having become queen, she attracted international attention as a Catholic queen in a Protestant nation, with the position of being able to introduce a counter reformation. In the Papal curia in Rome, she was seen as a Catholic in a heretic surrounding. The same year she became queen, her Polish adviser coadjutor Martin Kromer encouraged her to convert John III to Catholicism. She answered that she was willing, but that the monarch and the public would not accept it. Cardinal Commendone asked her sister, the Polish queen Anna Jagiellon, to support her in her religious-political task, and through Anna, she made contact with the Papal curia in Rome. A conflict arose between Catherine and Pope Pius V after it became known that she had received the communion "sub utraque", something which had been banned in the Trident meeting and since then regarded as a sign of heresy. In 1572, she asked for two papal advisers, and was given the Polish Jesuit Johan Herbst as her confessor. From 1572, Queen Catherine was in direct contact with Cardinal Stanislaus Hosius, who declared that he would serve as her support and ally in the work of counter reformation in Sweden and her messenger to the Pope. In the autumn of 1572, Catherine applied for dispensation to be given the right to receive the communion "sub utraque", as well as to be given certain dispensations regarding fasting. Her demands are seen as a way for John III to investigate how far the Catholic church would be willing to go to introduce a counter reformation, as certain changes would have to be made to make it possible. John III launched a new church order called "The Red Book". This was a form of mix between Protestantism and Catholicism that reintroduced numerous Catholic customs in the ceremonial life of the Swedish church, one of them being the use of Latin, which aroused a great deal of opposition and resulted in the Liturgical Battle, which was not to end for twenty years. Queen Catherine, Queen Anna, Cardinal Hosius and the pope negotiated for several years about this, and Catherine pointed out, that without certain dispensations for Sweden, a counter reformation would not be possible. In 1574, she was given absolution and dispensation regarding the fasting, but as the pope refused dispensation regarding the communion, she refused to take communion altogether. Her agent in Rome was Paolo Ferrari. The papal curia had serious hopes for a counter reformation in Sweden through her. In 1574, she received the Polish Jesuit Stanislaus Warszewicki, sent to her to as an ambassador from the pope and king Philip II of Spain. Catherine and John III were both eager to be given possession of her part of the Sforza inheritance after her mother in Italy. Queen Catherine had her own personal ambassadors in Rome to protect her interests, Petrus Rosinus and Ture Bielke. The papal curia was willing to help them in this issue, but as her inheritance was situated in the Kingdom of Naples, then belonging to Spain, the pope did not succeed. During the reign of King Stephen Báthory in Poland, the relation between Sweden and Poland, which affected Catherine's power position in Sweden and placed her in a difficult situation. In 1578-79 and 1579–80, she received the papal ambassador Antonio Possevino. He had been given the task to provide Catherine with her Sforza inheritance, mediate between Poland and Sweden and convert John III. He failed on all accounts. He did, however, confirm the marriage between the royal couple, which had been dubious in Rome, as it had lacked the dispensation which was necessary for Rome to consider a marriage between a Catholic and a Protestant as valid. In 1582, Catherine received the Polish ambassador Alamanni and explained that she was not in a position to convince John to make peace with Poland. At her next audience with the ambassador, she received him in the presence of her children Sigismund and Anna, and stated that Poland seldom had seen to her interests. Another interest was the rights of her son Sigismund to the Polish throne. She brought up both her children in the Catholic faith, which made Sigismund accepted as a Polish monarch. 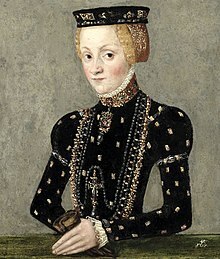 After the death of her childless brother Sigismund II Augustus in 1572, she considered her son to have rights to the Polish throne through her. However, after 1569, Poland had become an elective monarchy. This matter, however, also gave her an international significance. Queen Catherine had the son of the deposed Eric XIV sent to the Jesuit order in Poland in 1573. In 1575, the ban for the remaining convents in Sweden to accept novices was lifted. In 1576, she sent her son to be educated by the Jesuits in Braunsberg. She welcomed the Norwegian Jesuit Laurentius Nicolai from Rome and housed him in the former Franciscan monastery in Stockholm, that had been closed during the Reformation, and allowed him to open a Catholic school there (the Protestants stormed and closed the school in 1583). Queen Catherine strongly supported the old Vadstena Abbey, where the last nuns still lived, and often visited it. A new shrine was made for the relics of King Eric the Saint in the cathedral of Uppsala. In 1582, she received the former queen, Karin Månsdotter, and saw to it that her confiscated jewelry was returned to her. John III named Catherine prospective regent of Sweden during the minority of his son should he die while his son was a minor. In her final years, Catherine suffered from gout. She fell sick in the spring of 1583, died in Stockholm on 16 September 1583 and was buried in the royal crypt of the Uppsala Cathedral. The infusion of Polish blood into the Swedish royal lineage that begun with Catherine would cause considerable strife after her death in the context of the ongoing European wars of religion. Her son Sigismund inherited the thrones of both the Polish-Lithuanian Commonwealth (in 1587) and Sweden (in 1592), but ruled the latter only seven years before being deposed in 1599. Sigismund and his descendants, as Catholic kings, would continue to lay claim to de facto Protestant Sweden over the following century. The succession dispute contributed to the outbreak of several destructive wars until a massive Swedish invasion in the 1650s (known as the Deluge) nearly broke up the Polish-Lithuanian Commonwealth. Polish claims to the Swedish throne were finally relinquished in the 1660 Treaty of Oliva. The image of Catherine Jagiellon enjoyed a resurgence in 19th and 20th century Finnish culture and art. John and Catherine were the only Swedish monarchs to reside in the Finnish part of the Swedish realm for any length of time, and their alleged fondness for the land inspired Finnish nationalists. The religious issues that made Catherine unpopular with her contemporaries were by then long obsolete, and it has instead become traditional to depict her as a compassionate and loyal queen. The first version of the later famous royal palace of Drottningholm (The Queen's Islet) was founded for and named after her. Wikimedia Commons has media related to Catherine Jagellonica of Poland. ^ a b c d e f g h i j k l Katarina Jagellonica, urn:sbl:12406, Svenskt biografiskt lexikon (art av Birgitta Lager-Kromnow), hämtad 2013-12-05. ^ Eriksson 2007, p. 52. Katarina Jagellonica, urn:sbl:12406, Svenskt biografiskt lexikon (art av Birgitta Lager-Kromnow), hämtad 2013-12-05.